1599. While hunting a deadly adversary who has eluded him for two hundred years, Asgard Godard falls into an icy tomb that leaves him frozen in time. 1969. After more than a century on the run, Ethan Storm finds himself at the mercy of the man who ripped his family apart and sent him into exile. 2013. Following a hundred years of solitary existence, Olivia Ash wakes from a nightmare to find the home where she has lived her entire life under attack by a deadly foe. Linked by an incredible destiny and with time very much against them, Asgard, Ethan, and Olivia must keep ahead of their common enemy and the rogue branch of the US army at his command. But when an unlikely ally crosses their path, they come into possession of a set of clues that help them unearth their opponents' devastating plans. With the future of the entire world at risk, the three immortals must form new alliances and draw on all their unique skills and abilities to defeat the man who has inflicted so much loss and misery upon their lives. 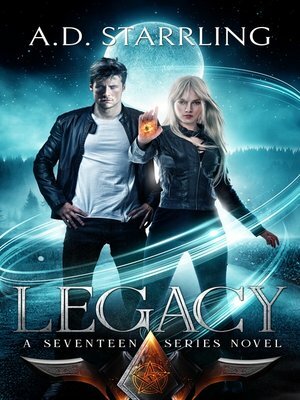 Legacy is the fascinating and furious fourth installment in AD Starrling's bestselling supernatural thriller series Seventeen. If you like high-octane adventures that combine science and fantasy, then you'll love the world of Seventeen. Grab this captivating thriller and continue the epic series today!